As the seasons change from summer to fall, there are many noticeable changes in the air. Certainly, temperatures are lower now than they were in the summer months. As the temperature falls, so does the humidity level – especially here in the Northeast. That being said, we thought it might be the perfect time to talk about wooden flutes and humidifiers. A wooden flute is something that is wonderful and somewhat mystical for those who are used to playing on a metal flute. Obviously, the composition of the body will determine quite a few points in regard to maintenance. Plus, let’s face it, wood can be a bit temperamental. That point coupled with the price tag of a Handmade Custom grenadilla Powell can leave new wooden flute owners in a state of panic when it comes to caring for these beautiful instruments! When we think about wooden instruments, one word comes to mind – the dreaded, five-letter word that starts with a “c” and ends with a “k.” You’ve probably heard teachers say, “Don’t do that or your instrument will crack!” What might you be doing that is dangerous? And why is it dangerous? Well, wooden instruments need to be kept in environments where there is consistency of temperature and humidity. Rapid changes can hurt the wood for a variety of reasons and result in cracks. Keeping the humidity level consistent is particularly important. Our wood technician assures us that the best way maintain a wooden flute is to play it regularly. 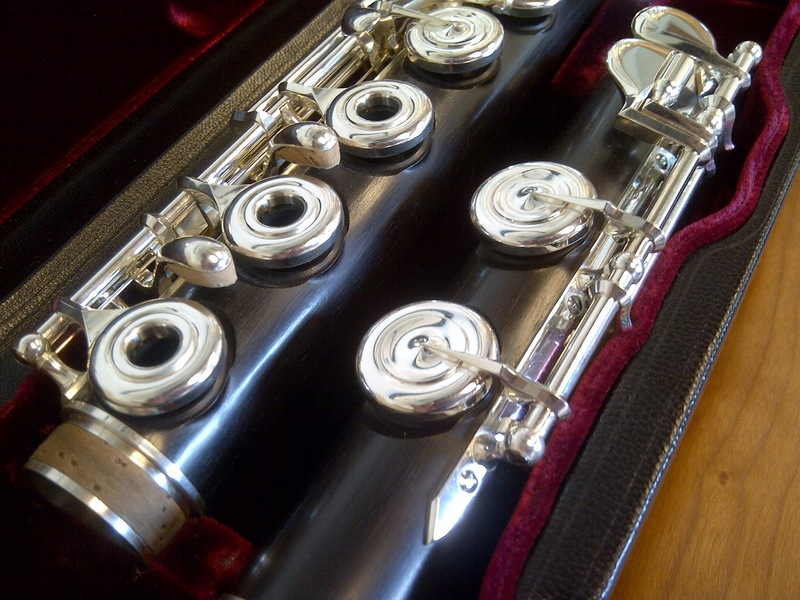 If you play it for a while, leave it for several months (untouched), and then pick it up to play it, you will notice differences which may make playing the instrument difficult. However, if it is played consistently, the wood will be acclimated to patterns of being played, swabbed out, placed in the case, and then played again. The cycle continues, and the wood is happy! As the humidity drops in the fall and winter months, it can become particularly stressful for your wooden flute. As you play, air goes through the instrument and condenses into water. You swab it out and put the flute back in its case. The bore is probably still warm and a bit moist – leaving it in a state where it wants to expand. 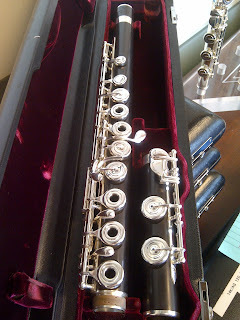 Meanwhile, the outside of the flute is surrounded by air that is cooler and lacking moisture, so it wants to contract. This is a difficult situation for the wood! Keeping the air around the flute humidified while the flute is in its case will help keep the wood “happier” because it is not prone to opposing tendencies in terms of contraction and expansion. So, how do you do this? Well, it is certainly helpful to keep some type of humidifier in the case when you have a wooden flute. This is especially important in dry, hot areas of the country, where players work very carefully at maintaining humidity levels in the case year-round. There are a few ways to humidify your instrument. One of the most commonly used items is a “dampit” humidifier, which is used regularly by string players. It looks like a long, skinny green tube with a yellow sponge inside. You’ll want to use the smallest one for your flute (usually a violin dampit). You can place it in the case on the space between the body and joints (headjoint or footjoint) – but never place it inside the body, headjoint, or footjoint. How moist should it be? Well, if you press the dampit and feel water coming out of the holes, the sponge inside is too damp. If the dampit is lacking “flexibility,” the sponge is too dry. A nice, middle-of-the road moistness if perfect. If you are looking for something less expensive, you could use orange peels instead of a dampit. They work well – and it’s simple enough to get hold of an orange! Finally, remember to treat your wooden flute very carefully when you take it from place to place. Don’t set it down next to a radiator after you’ve come in from the cold. Likewise, don’t place it in a cold, drafty area, either. If you are out and about – maybe having dinner after a concert – take the flute with you inside the restaurant. No one will laugh at you for taking the time to make your flute as comfortable as you would be! Wouldn't it be safer to use a room humidifier in the room where the flute will spend most of its time rather than the "dampit" humidifier? I would think this would be safer for protecting the metal parts of the wooden flute. A humidifier kept in the case with the wooden flute could cause the metal parts to rust of tarnish.